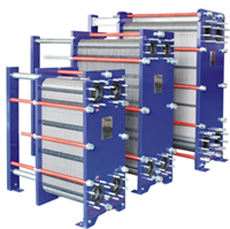 The plate and frame heat exchangers are widely applied in life. The global plate and frame heat exchanger market is expected to drive product significance over the forecast period reaching USD 5.99 billion by 2022, according to a new report by Grand View Research, Inc. Growing awareness towards energy efficiency coupled with construction space constraints is expected to drive the market over the forecast period. Surging demand for thermal management in district heating applications is expected to drive product significance in commercial and residential sectors over the long term. Technological advancements along with surging requirement for heat recovery utilities in chemical, food & beverage and HVAC sectors is expected to steer plate and frame heat exchangers market growth. Growing energy efficient utilities need along with expanding power generation infrastructure in economies including India, Vietnam, China and Thailand is anticipated to drive market growth. Welded systems emerged as the leading product segment and accounted for over 20% of total market revenue in 2014. Owing to its widespread use in oil & gas, automobile, pharmaceuticals, petrochemicals and paper manufacturing industries, the segment is expected to gain share over other counterparts over the next seven years. This product segment is anticipated to increase penetration in oil & gas industry owing to reduced chance of leakage and enhanced corrosion resistance. Chemicals emerged as the leading end-use industry with demand share estimated at 23.9% in 2014. Growing chemical & petrochemical industry particularly in the U.S., Germany and China is anticipated to impact plate & frame heat exchangers demand positively over the next seven years. HVAC & refrigeration is expected to witness the highest growth of 8.0% from 2015 to 2022. Europe was the leading regional market and accounted for 37.5% of global revenue in 2014. Increasing product use across refineries and chemical industries owing to stringent government regulations have been the major factor contributing for high penetration. Asia Pacific is expected to witness the highest gains in its market size over the forecast period. The region is expected to grow at an estimated CAGR of 8.4% from 2015 to 2022. The global industry is moderately fragmented with presence of large number participants across the globe. Major companies involved in manufacturing & distribution of plate heat exchangers include AIC S.A., API Heat Transfer, Danfoss, Fischer Maschinen-und Apparatebau AG, Kelvion, Guntner, Hisaka Works, Alfa Laval, Kaori Heat Treatment and SWEP International. Hofmann provides professional technology application solutions for heat exchangers, global technology services and on-site solutions of heat exchangers, and quality-reliable heat exchanger products.